When describing my Tante Lucy, “strong” is an understatement. The woman is a warrior. I’ve mentioned she’s been to hell and back a few times. A few years ago, Tante Lucy dictated some of her story and my cousin transcribed. I’d like to share a few excerpts with you. She’s been through more tragedy in one day than I will ever experience in my entire life. (Pre-WWII Prussia)I am Lucy Koenig. I was born to Rosa Kontowski on April 30, 1930, father unknown. We lived with my grandparents. I went to school for 8 years. After, I left home to work for a teacher’s family with four children, ages 16, 14, 12, and 10. I worked for 8 months until the war got too close and I went home to be by my family. That family I worked for got killed. Only one son survived. I went to visit him one time. It was a hard time for me until we were all together in America. Our father, Josef Weinert, was born in Sternsee on a farm, maybe 20km away from our village. Rosa met Josef in 1935 and they married in 1936. She wore a sky blue dress and a veil. I was six years old. I loved him as my dad. He gave me his name. 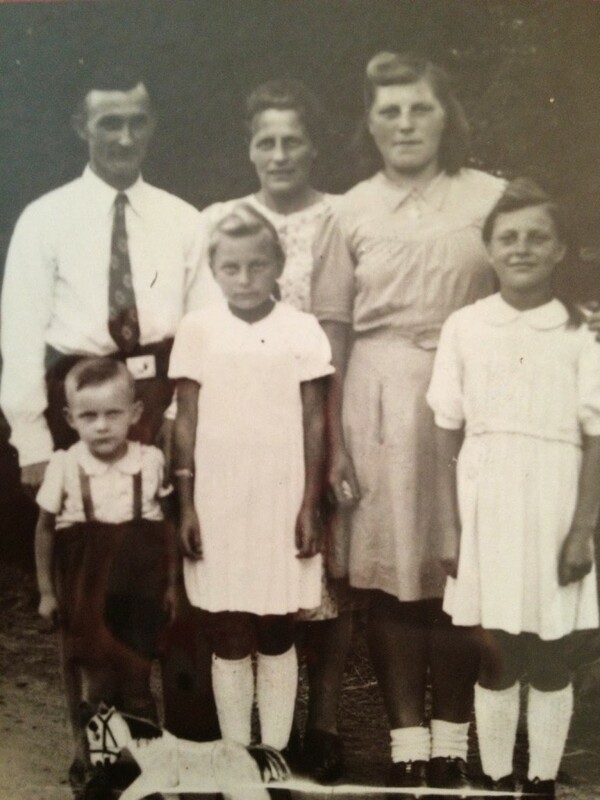 My sister Anna Marie was born in ’37, Maria Magdalene in ’39, Gerhard (Andee’s Dad) in ’44, and Karl Heinz in ’48. He lived only 4 months and died on 12-30-48. The war started in 1939, our father was the first to go and they sent him to France. He was wounded by a grenade. He learned of Gerhard’s birth while at war. He was sent to a hospital close to us for his injury. When the Russians came, he fled to West Germany somewhere near Hanover. We lost our home on 1-30-45. The first few soldiers came and looked at the house. In two hours we were forced to leave. Our mother and the younger children left. I was forced to stay behind with my cousins, Hedwig and Agnes to work. The family was staying with friends not far from were I was. During the day, they brought all of us to work on the farm. Mom and the other adults were on one part of the farm taking care of the animals. The teenagers were on the other part doing chores. I did not have contact with Mom, but I could see her come and go on the trucks. Mom came home three months later and was very ill. We were re-united with Dad about two years later. This was part of the hellish journey my aunt experienced. It’s still a little hard for me to process – especially all of the story at once. Tomorrow, I’ll post more. Hopefully you’ll grow to appreciate this woman as much as I do.